ERP 10QBP0229 Microwave Oven Magnetron. Exact replacement for GE Part #'s WB27X10017, WB27X10489, WB27X10880, WB27X10735, WB27X10226, WB49X1022.Direct replacement for Samsung OM75P(10)ESHL Replaces other magnetrons also. 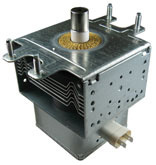 SAVE HUGE $$$ OVER OEM WITH THIS ERP (EXACT REPLACEMENT PARTS) MAGNETRON!